The Library of Congress photographic archive contains this unusual photograph of a traffic sign from the "Carpenter collection. 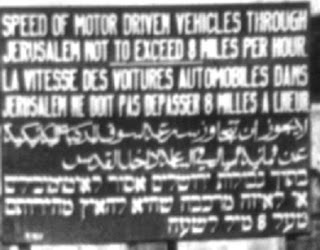 *" The sign limited the speed of motor vehicles within Jerusalem to 8 miles per hour. 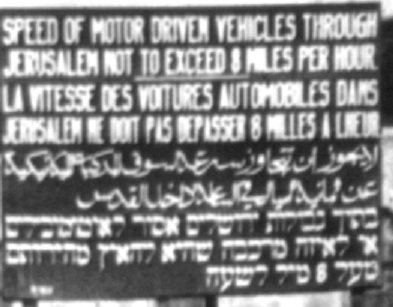 Actually, it is an enlargement taken from a noteworthy picture showing a signpost pointing to "Jaffa Road, Ramleh, Lod (Lydda or Ludd) & Jaffa" to the left and "Hebron Road, Jaffa Gate, Bethlehem & Hebron" to the right. The picture was probably taken soon after the British army captured Jerusalem in December 1917. We don't know who posed for the picture, but from the background we know exactly where it was taken -- opposite the Old City walls and the "New Gate" into the Christian Quarter. The first building behind the signs is the French Hospital of St. Louis des Français, first established in 1851 inside the Old City. The second is Notre Dame de France (now Notre Dame de Jerusalem) whose cornerstone was laid in 1885. When it received its first pilgrims in 1888, the center could accommodate 1,600 guests in 400 rooms. As the Ottoman Empire unraveled in the 19th Century, it signed contracts and treaties -- called capitulations -- with countries such as Russia, France, Austria and Germany granting the countries a degree of control over their subjects living in the Ottoman Empire and even autonomy when dealing with their own citizens. The French institutions in this picture -- representing Roman Catholic interests -- competed with the Russian institutions, often representing Eastern Catholics. 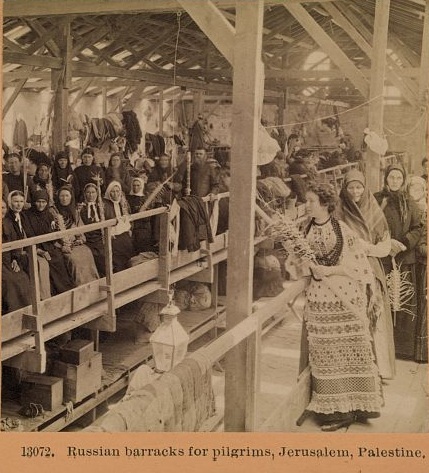 The Russian pilgrims' hostel and medical facility were located in the Jerusalem "Russian Compound" which had a clear view of the Old City to the south. The French facilities were built across the road from the Old City, blocking the Russians' view. and Notre Dame is the second. The Old City wall is on the right. 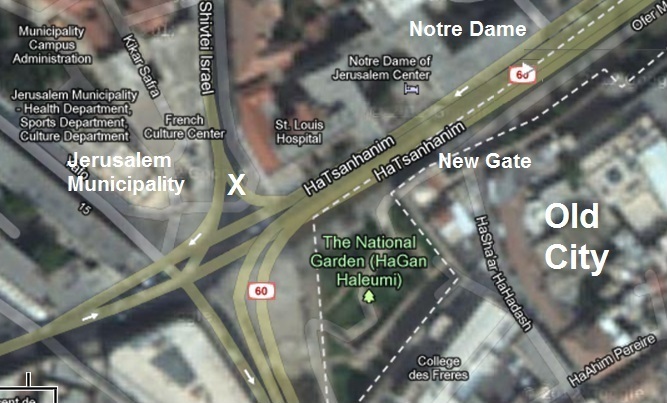 In 1948, fierce battles took place took place between Arab and Jewish forces around Notre Dame and the St. Louis hospital, and from 1949 until 1967 the area became a no man's line between the Jordanian and Israeli armies. In the 1967 war Israel captured the Old City after heavy fighting. The two institutions reopened to serve pilgrims and the local Arab population. 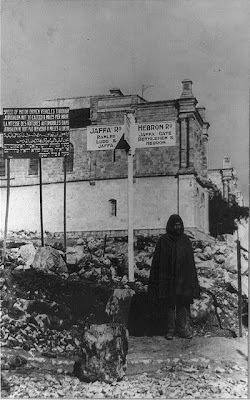 *According to the Library of Congress, "The Frank and Frances Carpenter Collection consists of photographs produced and gathered by Frank G. Carpenter (1855-1924) and his daughter Frances (1890-1972) to illustrate his writings on travel and world geography. Carpenter's works helped popularize cultural anthropology and geography in the early years of the 20th Century. 1.This is the hospital where the famous story of the fallen dentures took place. Many people mistakenly think that the story took place in the Notredam, but the Notredam never had nuns (but rather monks). Several women are holding palm branches -- but they're not the Lulav used by Jews on Sukkot. The day is clearly Palm Sunday, the week before Easter, which takes place in the Spring. Sukkot, of course, takes place in the Fall.